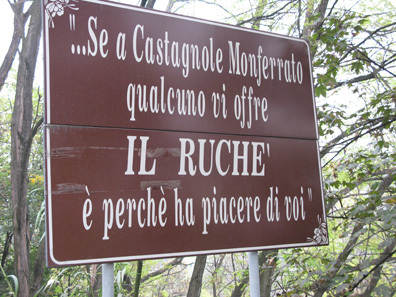 If someone in Castagnole Monferrato offers you a glass of Ruchè, it’s because he or she is pleased to have you there. Or so says the road sign you’ll see on the way into this quaint village. You’ll also see a big sign on the way in that says CUORE DEL RUCHÈ (heart of Ruché) in big red letters on a concrete retaining wall. This rural paradise is also the heart of agnolotti and truffles which makes this place a real destination. At least for me. Ruchè (roo-kay), one of hundreds of Italian varietals you’re not likely to have heard of let alone tasted, is synonymous with this tiny village in the hills just outside of Asti and one of Piedmont’s real treasures. There are just 75 hectares of this grape planted in Italy, all jn the Monferrato hills in Asti and Alessandria provinces in the southeast of the region (if you’ve ever taken the A21 freeway from one of Milan’s airports towards Turin, Asti or the Langhe, you’ve driven through here.) 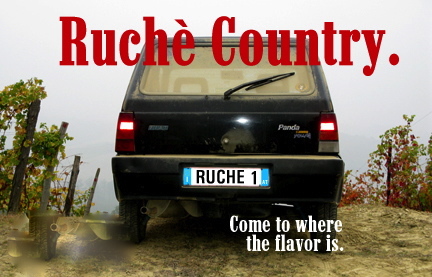 Just 40 of those hectares are qualified for production of DOCG Ruché making this a micro zone, perhaps Italy’s smallest. Indeed, not much of this wine manages to escape local consumption so it’s not exactly a staple of Italian wine lists or shops here in the US. There are a few producers making serious examples of this wine however and they’re absolutely worth your regard. In my mind the top three are Luca Ferraris, Montalbera and this one from Crivelli. You’re probably familiar with the local classics from this zone; Nebbiolo, Barbera and Dolcetto from the Langhe and environs and maybe even exotics like Pelaverga and Freisa, both suspected relatives of Nebbiolo. Ruché is a bit more mysterious. It’s name and origins aren’t very well understood and considering its ghostlike status, it’s not surprising that almost nothing has been written about it in the mainstream wine press. 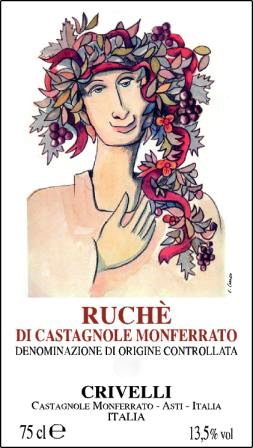 I couldn’t find even a mention of either Ruché or Monferrato in Sheldon Wasserman’s otherwise dizzyingly comprehensive magnum opus Italy’s Noble Red Wines . This can be serious stuff. Pretty floral aromatics and firm structure with rich fruit. It’s about time to take a closer look at this compelling wine. The Crivelli estate, created by Marco Crivelli from vineyards that his family had been supplying the local co-op with since the turn of the last century, is now being run by Marco and son Jonathan. Sustainable farming practices and low yields, as always, create the foundation for great wine and that’s the model here. If I were to use one word to describe this wine it would be savory. Roses, red cherries and geraniums on the nose with lots of deep red fruit and sparks of black pepper and cinnamon followed by crunchy minerality. Unique yet reminiscent of the best of the local Nebbiolo based Barbaresco and Barolo. And have I mentioned the price? $25. Never easy to source so this may be the last available for awhile.